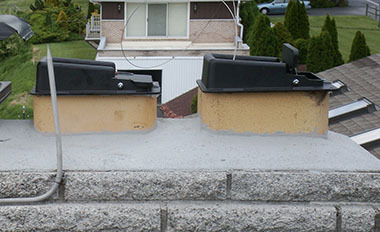 Studies have found that standard masonry dampers are extremely inefficient at keeping out cold air, and keeping in your hot air. What many home owners don't think about is that the fireplace flue is a two way street. Hot air is always going up and cold air is always coming down. Independent studies have found as much as 2-3x the house volume of air goes up the flue as wasted energy every hour during a fire--very inefficient! Standard bottom dampers are just metal on metal and do not have a gasket to seal them so when you are not using your flue and the damper is closed there is a ~20% inefficiency which creates cold drafts but also massive heat loss out the flue. You are paying for that via your main source of heat: electric, gas, or oil--approximately $200/year for a single average sized flue. 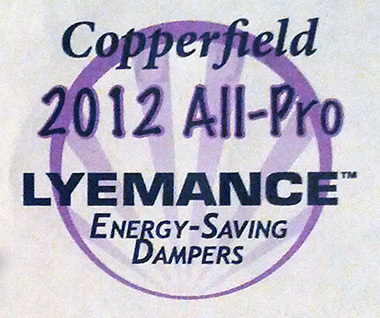 For homes with more than one flue we highly recommend top mount dampers: A customer of ours had four large masonry fireplaces and two oil furnaces and the oil furnaces could not overpower the heat loss from the inefficient standard dampers. We installed four top mount dampers and the results were noticed immediately! Clean Sweep has been saving customers thousands of dollars every year through the selling of top mount dampers. 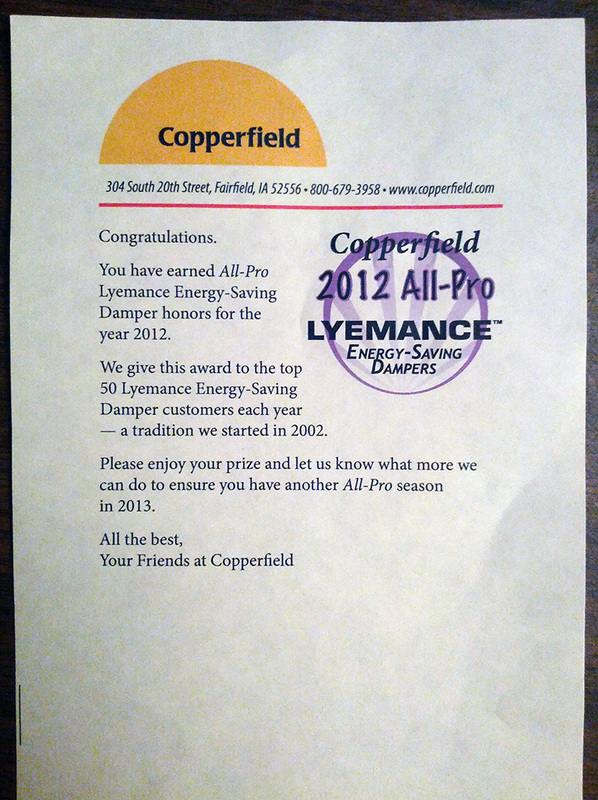 We sell so many that we received an award for being one of the top 50 sellers nation-wide of Lyemance Top Mount dampers--quite the honor! So what is the solution? 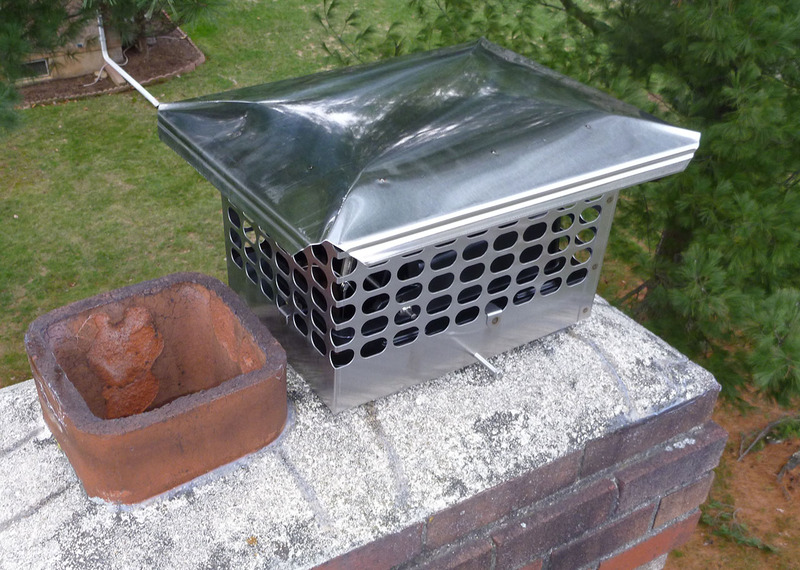 By changing to a top mount damper the damper now sits all the way on the top of the chimney underneath a compatible stainless steel cap. This new damper has a gasket which allows for a 99% seal. A 1% bleed off allows for circulation of moisture to avoid any moisture damage. A stainless steel aircraft grade cable runs from the top of the flue to the firebox where it is inserted into a bracket that has a handle. This allows you to pull down and close it, and open it by creating slack on the cable as it is spring loaded on the top. Because you don't have to stick your head in the fireplace it is also very easy to tell if the damper is opened or closed. Eliminates smells from traveling down the flue--no more creosote stink! As the chimney is a resonating tube, it also reduces sounds drastically. This is useful if your home is near a busy street or a flight path. To determine the actual size of your fireplace flue we may have to come and check it in person but our standard pricing is as follows. To purchase please contact us to set up an appointment. Please do note that additional fees may apply if the top tile is damaged or un-even (which would require repair first) or if additional access fees are required. Clean Sweep - A top 50 seller in 2012!